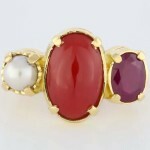 A very fine trilogy multi stone ring consisting of a very fine real sea salt water pearl, very fine real sea coral and fine Burma Ruby all set in Gold. This is a power ring and recommended for natives with lagna of Cancer, Leo, Scorpio & Aries. This ring enhances the wearer’s health, stability, defence against any crisis, flow of income, wealth, assets, power, confidence, peace of mind, sharpness, recognition, appreciation, decision making strategy, rise in professional status, prestige, honour, rise in luck, bravery, confidence, fire in the belly, achievements, success, prosperity, name, fame & establishment.